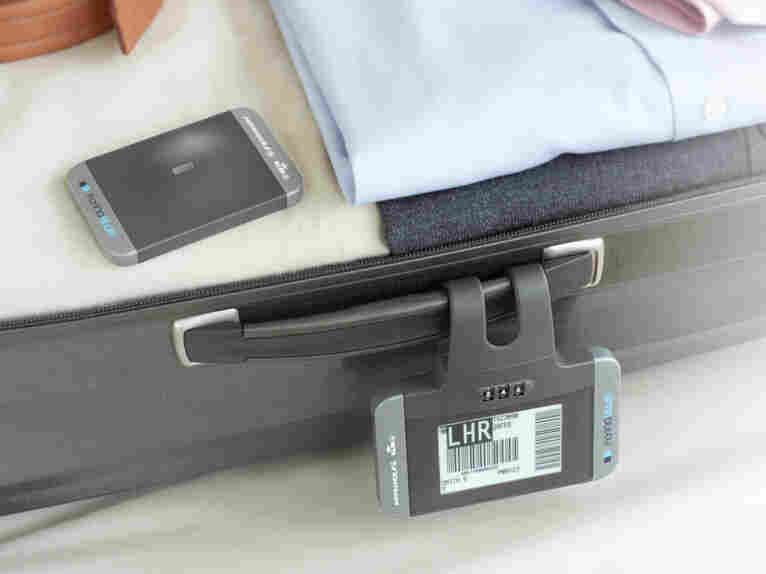 Weekly Innovation: Better Luggage Checking ... And Tracking : All Tech Considered Air France and KLM have developed two gadgets — the eTrack and the eTag — that let you drop off your bag without checking it with an agent and track it during your trip. Coming in December: the eTrack and the eTag, from Air France and KLM. The innovations let you drop off your bags without checking them, and track them throughout your journey. While the magic of flight is still worth marveling at (Note: This video contains adult language some might find offensive), the airline industry remains held back in a few areas that really need an upgrade. It's 2014 and you can still find gate agents using dot matrix printers. And we've already written about the hopelessly poor user experience of paper boarding passes. But at the end of this year, Air France and KLM are rolling out an innovation for the baggage-checking part of your journeys. Since checking a bag often means waiting in long lines and mysteriously lost luggage, the airlines have developed a pair of tools to let passengers more easily check and track their luggage: the eTag and the eTrack. The eTag is a permanent electronic label that lets you load the flight data for the tag at home before the flight, replacing the current airline luggage sticker. It uses Bluetooth technology and syncs with your smartphone, so passengers won't need to relabel bags for each trip — details are updated automatically. But perhaps the most time-saving part of this is that using the eTag means passengers get to just drop off bags at a fast drop, no agent interaction required. Separately, the eTrack is a geolocating gadget to pop inside your luggage so you can trace it worldwide. That location information will be available to both the customer (through a smartphone app) and the airline, so if a bag is misplaced or shows up on the wrong aircraft, the airline can get to it. As you might expect, battery life of the eTrack — the homing device for your bag — will be a bit of a hassle. It needs to be recharged after about 10 flights, depending on how often you ping your suitcase. While the devices will be sold separately, passengers can use the eTag and eTrack together. The product folks behind the effort say they're hoping these devices become adopted by other airlines across the industry. "We've worked closely with our suppliers and with Delta to try to make this an industry initiative, not just an airline initiative," Manuel van Lijf, Air France-KLM's product innovation manager, told FutureTravelExperience.com. "The idea was to create a product that can be used by a passenger flying with Air France, KLM, Delta, Lufthansa or another airline, for instance. Why would a passenger buy a permanent tag that can only be used on one airline?" There's no price tag on these devices yet, but the airlines have said frequent fliers will get to try them out first. The plan is to start releasing the eTrack and eTag in December to a small group of travelers and then roll them out to more users.